There’s a reason you want to go where everybody’s always glad you came—it just feels nice. We love to travel, but sometimes navigating new places and dealing with less than accommodating locals can take the fun right out of it. So we’ve found 13 cities that go above and beyond to welcome travelers with open arms (and stellar amenities) to ensure the smooth sailing vacation of your dreams. If you know all too well the impersonal service or intimidating nature of larger destinations, let your wanderlust lead you to one of these inviting cities. For tourists, these are the friendliest cities in America, and we’ve given them ratings from 1 to 5 for features that most make or break any travel experience. This is our second-annual list, so for even more options, make sure to check last year’s choices. From Anchorage, nature surrounds on a scale few get to experience. Luckily, there are lots of tour options to help you see it all. For instance, NOVA offers river rafting and glacier hiking adventures that get you up close and personal with this majestic region. There are 60 glaciers within 50 miles of the city, and wildlife viewing is a thrill when you spot bears, Dall sheep, moose, and even whales. Cross Northern Lights viewing off your bucket list in Chugach State Park, and ask friendly locals all about their beautiful city at festivals like the Fur Rondy, Iditarod Sled Race, and the Slam’n Salm’n Derby. This Texas gem has something for everyone. Foodies can find their fix at favorites like Three Little Pigs, Steel City Pops, and Guero’s Taco Bar. Music lovers obviously know Austin, which is about as tunes-obsessed as a place can get. Venues are everywhere, even the street corners, and spots like The Continental Club, Little Longhorn Saloon, and ACL will make you feel like you’ve escaped to sonic utopia. If art is your jam, Harry Ransom Center, The Contemporary Austin, and street art galore deliver. Love the outdoors? Explore the lovely waterways by kayaking Barton Creek. Tours are a great way to get acquainted, so join a music or brewery tour to get a sense of the city’s goods. Sailing, lobster fishing, hiking, sightseeing…Bar Harbor offers all the makings of a seriously sweet getaway. Between Acadia National Park, Cadillac Mountain, and the riches of Frenchman Bay, you can soak up all the revitalizing powers of nature, and get a taste of its bounties as well. After a day on the water, find the best of the local seas at Mache Bistro. For a spine-tingling experience you will not forget, the city’s Haunted History Tours take you through backstreets, lighthouses, and cemeteries. If you prefer your cultural experience without a side of goosebumps, Abbe Museum, Dorr Museum of Natural History, and Millionaire’s Row fit the bill. Want to star in your own western? Your starry-eyed dreams can come true in Deadwood. Don your best poker face at Cadillac Jack’s or Deadwood Mountain Grand. If you rather prospect than bet, go on a gold panning tour or take the Broken Boot Gold Mine candlelight tour. See the refined side of the Old West at the Historic Adams House, where you can tour the well-to-do spaces of Deadwood. Carriages, buggies, artifacts, and more are on display at the Days of ’76 Museum. Sidle up to the bar at Nugget Saloon, where you’re more likely to find a cold beer and a slice of pizza than a showdown at high noon, but we can’t rule anything out. The gift of the past is that it’s an incredible teacher, and Gettysburg is the perfect place to get an education in American history. The National Military Park is the center of the action and comprises all major and relevant areas of the battle, including Gettysburg National Cemetery and The Gettysburg Museum and Visitor Center, which houses many of the park’s 43,000 Civil War artifacts. Other important stops include Eisenhower National Historic Site, Shriver House Museum, Rupp House, and the Gettysburg Museum of History. Don’t forget to pause at Sachs Covered Bridge for a photo op. It was originally constructed in 1852, and was an important structure during the Battle of Gettysburg. Along the Emerald Coast, you get three for the price of one. The towns of Destin, Fort Walton Beach, and Okaloosa Island form a tight-knit network of tourism bliss. Each brings something unique to the table, but all share the trait of being the perfect destination for watersports, shopping, dining, beachgoing, and ecotourism. The Boardwalk on Okaloosa Island brings the added sparkle of evening fireworks, and you can also grab casual fare—from seafood to burgers to gelato. You’ll stay busy in Destin, where Big Kahuna’s Waterpark will have you screaming and splashing, and you can chill out at Destin Harbor Boardwalk, from where you can fish, boat, and take a water tour. True respite for the travel-weary is Napa’s MO, where the land stretches lazily and the golden sun sinks behind gently rolling hills. The most relaxed way to see it all is quietly from above. Let Balloons Above the Valley lift you up and away. Cover a lot of ground on the Wine Train, where you can harken back to a simpler era, when enjoying food and finery came at a slower pace. Kick things up a notch in Napa’s thriving nightlife scene at places like Downtown Joe’s. Sleep like a baby in any of Napa’s world-class hotels and inns (we love the elegant White House Inn). And of course, the reason for the season—wine tasting isn’t mandatory in Napa, but maybe it should be. With hundreds of area wineries that include some of the best in the world, Napa spoils you for choice. 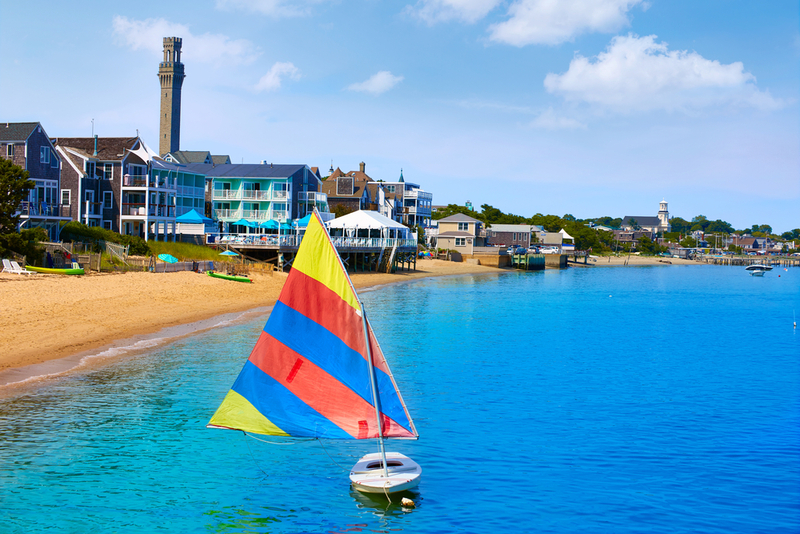 Ptown is the place to let loose and set your worries at the door. It’s charming, it’s friendly, it’s accepting of everyone, it has an unwavering sense of fun, and it’s downright adorable. Keep your vacation funds from burning a hole it your pocket on Commercial Street, where you can find everything from leather goods to shell jewelry. Nature beckons in Beech Forest, where there is tree-covered hiking to be had. Cyclists are also in luck. The town is very bikeable, and Province Lands Bike Trail loops 5.45 miles through aromatic pine forests, stately sand dunes, and colorful cranberry bogs. Take to the seas by sailboat or SUP, catch some live music at nearby Wellfleet Preservation Hall, and let your hair down at the Crown and Anchor nightclub. Some places are so quietly impressive you feel their positive energy greet you upon arrival. Sedona’s inspiring influence makes it a spiritual rite of passage, with awe-striking nearby places like the Grand Canyon (one of the top tourist destinations in the USA) and the red rocks that leave visitors meditating on the wonders of the natural world. Get on the city’s frequency at Amitabha Stupa Peace Park, and the Tlaquepaque Arts & Crafts Village. Take your pick from 300 miles of trails for a serene desert hike, or if you prefer a bit more bounce in your step, sign up for a 4×4 excursion with Sedona Offroad Adventures. History, music, homey small-town vibes, and classic Southern flavors are partially what define the appeal of Natchez, but it also has an indefinable quality that makes it feel like nowhere else. Gold Record Road, which connects the Americana Music Triangle, loops through town twice, and with good reason. The history of music stretches back 300 years here, and blends Natchez Indian, French, Spanish, and African cultures. Learn more about its diverse history at the Grand Village of Natchez Indians and the Natchez Museum of African American History and Culture. The Melrose Mansion is a pristine example of Greek Revival style, and you can see even more historical architecture on a Natchez Pilgrimage Tour. Though the residents are few, St. John has friendliness in abundance. And for tourists looking to get away from it all, this island is your new BFF. While activities are aplenty, lounging, sipping, and taking it easy are highly encouraged. When you do awake from your downtime, snorkeling, water activities, land adventures, and historical sites await. At three excellent diving sites—Eagle Shoals, Carvel Rock, and Tektite—you can swim with 500 species of fish and 40 types of coral, from horse-eye jacks to Caribbean spiny lobster. Land exploration is most fun here by horse, and you can find a great equine pal at Carolina Corral. For liquid treats and island-style eats, head to Morgan’s Mango. The historic part of the city, Colonial Williamsburg, was reimagined for tourists, and remains one of the top tourist cities in the USA. You can step back in time here, where the costumed townsfolk are on hand to answer questions, give demonstrations, and immerse you in the experience of the early United States. Take a carriage ride through town, and first-timers can follow the curated itineraries from the super helpful Visitor Center. Take a breather from history in the rest of Williamsburg, where you can thrill-seek at Go Ape treetop adventures and Water Country USA. Pick your modern-day tipple at Copper Fox Distillery, Williamsburg Winery, or Virginia Beer Co., and toast to the future. Storybook charm is everywhere on Mackinac Island, where the Grand Hotel is the eye-catching centerpiece of this unique getaway. Leave no page unturned while in town; a Mackinac Revealed tour will introduce you to all the people, nature, island history, and horses. Yep, this place is so quaint horse-drawn carriage is the main mode of transportation. Visit Cindy’s Riding Stable to ride your own steed, or visit Great Turtle Kayak Tours if you prefer to explore by water. Let your imagination wander at the Original Butterfly House & Insect World, and don’t forget to treat yourself (at least once) to some Original Murdick’s Fudge before you make your way back to reality. Ready to check out these tourist-friendly cities for yourself? Use the Expedia mobile app to book your next trip! What are the best cities for tourists in America? Let us know in the comments! Some places beckon to travelers with their popularity and wealth of things to do, but sometimes those things can come with a cost. In some of the most popular tourist cities, not everyone is happy to see you. From disgruntled locals to overworked hospitality professionals, less than welcoming aspects can color a trip in a negative light. Thankfully, there are plenty of cities that welcome travelers with open arms, and we’ve rounded up the 16 places where you’ll find the warmest welcome. Based on the following criteria and rated from 1 to 5 ⭐ in each category, these choices represent helpful, hospitable, comfortable, and easy-to-navigate places that never met a stranger they didn’t help out. Feel free to pull out your camera, ask for directions and recommendations, or simply look around in wonder—in these friendly cities, no one will judge you for it. Outdoor lovers are especially welcome in Bozeman, where you’ll be in close proximity to Yellowstone National Park and surrounded by mountains. Locals love to take advantage of the bounty they’re blessed with, and many will be more than happy to offer tips for favorite hikes and camping spots. For the urban-minded, there are plenty of hotel options, like the LARK Bozeman, and the Historic Neighborhood Walking Tour will introduce you to excellent spots to explore in town. Though California is tolerant and laidback, some of its bigger cities can be difficult to navigate and in too much of a hurry to be much help to a curious tourist. One of the friendliest cities in the U.S., SLO embodies just the opposite, and refers to itself as the Happiest Place in America. Once you experience its proximity to beautiful beaches, its superb area wineries, and its plethora of activities, you’ll get it immediately. Take a Breakaway Tours wine tour, and spend a day at Hearst Castle in neighboring San Simeon. For a major metropolis, Chicago is surprisingly big-hearted. Maybe it’s all the good food and neighborhood bars, maybe it’s the Midwest mentality, or maybe it just can’t be explained. Whatever the case may be, Chicago is one of the best cities to travel to in the U.S. Chicago Architecture Foundation offers amazing tours, or for a unique vantage point, take a sunset helicopter tour. Museums, galleries, boutiques, parks—the list of things to do goes on and on. Don’t miss treasures like Chicago Cultural Center and Garfield Park Conservatory. If food is the way to your heart, let Columbus restaurants charm and impress you. Katalina’s Café, housed in a 100-year-old gas station, has all the personality and welcoming spirit you can ask for. Nothing induces good vibes better than a perfect scoop of ice cream, and Jeni’s delivers delightful flavors such as sun-popped corn and milkiest chocolate. You can reach all the goods almost as soon as you land—AirConnect shuttles run from the airport every 30 minutes, and cost less than a Dirty Frank’s hot dog (the most affordably delicious bite in town). Tourism is the watchword at this infinitely visitable beach town, where the water’s fine and the residents are friendly. Cinnamon Rainbows Surf Company is passionate about its work, and is a go-to for quality surf lessons and gear. During summer, visitors are treated to nightly shows on Sea Shell stage, a common central gathering spot. For more local entertainment, as well as a super fun atmosphere, great food and drinks, and killer coastal views, Bernie’s Beach Bar is the place. Homey accommodations are yours at Sea Spray Condos. As the smallest town in Massachusetts (by population), North Adams packs a big punch. With events such as Solid Sound Music Festival, world-class exhibits at places like MASS MoCA, whole foods and fresh meals at Eat to Total Health, and the self-described “affable, quaffable brews” of Bright Ideas Brewing, you might just decide to be tourist-turned-local by the end of your trip. Add to all this street festivals, beach parties, fall foliage parades, the must-see North Adams Motorama, as well as many surrounding parks and trails to explore, and you really may decide to settle in for good. Wonder awaits in the Petoskey area, where you can tour nearby Castle Farms in the daylight then head 36 miles north to catch a glimpse of the Northern Lights at Headlands International Dark Sky Park. With an A+ crime rating, Petoskey is a leader in the safe cities club. Stick close to home base and indulge in area wine at Petoskey Farms Vineyard & Winery or at their downtown tasting room. Bring home local goods from American Spoon, where the friendly flavors of fruit spreads and butters, toasted granola, and unique sauces and condiments will serve as reminders of your sojourn in this charming town. Don’t forget to spend some time enjoying the marvels of Lake Michigan before you go! Strong musical roots, its own rich style of barbecue, one of the most visited houses in America, incredible museums, a boisterous pedestrian mall lined with venues, shops, and eateries—the list of ways Memphis happily tempts travelers goes on and on. You can’t go to one of the top U.S. tourist cities and not visit its most famous draw, so Graceland is pretty much a must. Didn’t know you were suppressing the need to dance it out in the halls of a museum? Memphis welcomes you! Don’t forego the Stax Museum of American Soul Music, where the Express Yourself dance floor will both add and check off this unexpected bucket list item. Take a Memphis Riverboat tour, get schooled at the National Civil Rights Museum, and don’t forget to get messy with a plate of Leonard’s Pit Barbecue. You’ll be treated like family here. Twenty miles from Seattle, and merely 8 miles from Sea-Tac Airport, this ultra-accessible city is full of parks, waterways, sporting venues, and friendly faces, and is the perfect center for exploring the wider region, and a tourist’s dream. Visit its first historical landmark, Mill Creek Canyon Earthworks, an environmental art piece designed by Bauhaus artist Herbert Bayer in 1982. Taste award-winning beer on tap at Airways Brewing, then take in the current exhibit at Centennial Center Gallery. Local produce is revered, and Carpinito Brothers’ farm and produce market are your key to tasting Washington’s freshest. The phrase home away from home really means something in Merriam, where familial vibes are strong, a warm meal made with love is easy to come by, and community events bring everyone together. Start at Merriam Marketplace downtown, host to the Merriam Farmers Market and other gathering opportunities. A stroll through Antioch Park, with its winding over-water boardwalk, lush trees, and the scaled-down Wild West Dodge Town play area will make for a peaceful afternoon. Follow your nose to Strawberry Hill Povitica, a town favorite that will have you forever craving the sweet swirled bread from which it takes its name. Travelers in search of everything culinary, rejoice. Raleigh is true flavor country, where inventive dishes meet with tradition and reimagine familiar tastes. Take Brewery Bhavana, where top-notch local beers pair with the age-old delights of the dim sum experience in a serene and upscale setting. Feel like letting your hair down? Neptune’s Parlour has arcade games, pinball, late-night DJs, and let’s not forget the drinks. In between amazing meals, meet the friendly locals at great events throughout the year—North Carolina Chinese Lantern Festival, North Carolina State Fair, Hopscotch Music Festival, and the African American Cultural Festival of Raleigh and Wake County, to name a few. With a beautiful resort right in the center of town, this lake city is primed and ready to accept visitors. The surrounding mountainous region is rife with gems to stumble upon, whether they be hiking trails, unique eateries, historical towns, or any of the 55 nearby lakes. Coeur d’Alene Arts and Culture Alliance events are perfect for immersing yourself in the culture of the area, while ROW Adventure Center will bring you into the great outdoors via kayak, raft, bike, or SUP. For a delightful no-frills bite in a family-run mainstay, Hudson’s Hamburgers will welcome you like an old friend—just don’t try to order fries or you may get a bit of side-eye. Art, history, festivals, natural beauty, and nice people are only part of the gifts Winona bestows on visitors. From the Great River Shakespeare Festival to the Great Dakota Gathering, this town loves to welcome guests with big celebrations. Take a walking tour of downtown or hop on the Trester Trolley for glimpses of beautiful brick buildings and Tiffany stained glass, then sit down for a glass and a snack at The Oaks wine bar. Take to the water with Broken Paddle Guiding Company, which introduces guests to the tree-lined splendor of the Upper Mississippi River. Anyone who has been to New Orleans knows there is something special about the way the whole city seems to envelope you. Maybe it’s the humidity, but we think it’s more likely the warmth of its people, who know how to celebrate in all the right ways. The city hosts festivals and events around the calendar, so you will never run out of dynamic things to do. Don’t get lost in the crowd at Mardi Gras; come during New Orleans Jazz and Heritage Festival, NOLA Downtown Music and Arts Festival, or the Bayou Boogaloo. Better yet, visit any time and drink in classic NOLA. The Sazerac Bar will serve you up the famous local drink that lends its name, grab a sack of boiled crawfish from Schaefer’s, and pick up a muffuletta from Central Grocery. Thirty miles from Washington, D.C., and surrounded by nature, Manassas is happily situated for tourists who like to explore. The Manassas Museum System offers tours for the knowledge-thirsty, while just plain thirst is quelled at family-run BadWolf Brewing Company, where the atmosphere is way friendlier than the name suggests. Get your days going at cozy Jirani Coffeehouse, complete with an in-house library. Visiting in fall? Take the family to nearby Cox Farms for the Fall Festival and meet the locals (and a few llamas, rabbits, chickens, and goats). Back in town, fill up at Okra’s Cajun Creole and see a show at Hylton Performing Arts Center. Spice things up in Buffalo, namesake of the beloved comfort food, Buffalo chicken wings. You must try the original at Anchor Bar, which has seen more than its share of passers-through (celebrities included). The views at nearby Niagara Falls State Park are no less bright than the fiery sauce, but they do skew toward more naturally hued. For more man-made masterpieces, Albright-Knox Art Gallery wows with de Kooning, Rousseau, Miró, and more. With much to see and do in the area, plan for a long stay full of hospitality and adventure. If all that choice is overwhelming, start with a tour to at least scratch the surface. Where have you experienced the warmest welcome?